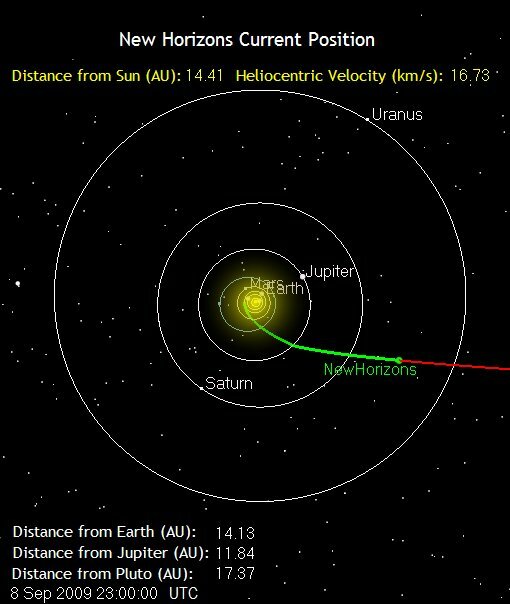 New Horizons sails silently today through another milestone on the way to its historic reconnaissance of the Pluto system, reaching the halfway point between the orbits of Saturn and Uranus. Not that the spacecraft “sensed” today’s moment; New Horizons entered hibernation on Aug. 27 after its annual checkout and won’t be stirred again by the mission operations team until Nov. 9. New Horizons, launched more than 3½ years ago on Jan. 19, 2006, is approximately 1.3 billion miles (2.1 billion kilometers) from Earth, speeding away from the Sun at just over 37,000 miles per hour. The spacecraft will actually cross the orbit of Uranus on March 18, 2011. Follow New Horizons’ journey at http://pluto.jhuapl.edu/Mission/Where-is-New-Horizons/index.php.